Recognition of prior learning (RPL) in South Africa is critical to the development of an equitable education and training system. Historically, nursing has been known as one of the professions that provides access to the training and education of marginalised groups who have minimal access to formal education. The advent of implementing RPL in nursing has, however, not been without challenges. The purpose of this study was to explore and describe the experiences of RPL nursing candidates related to a 4-year comprehensive nursing training programme at a nursing education institution in Gauteng. An exploratory, descriptive and contextual qualitative research design was undertaken. The research sample comprised 13 purposefully selected participants. Face-to-face individual interviews, using open-ended questions, were used to collect data, which were analysed using Tesch's approach. Recognition of prior learning candidates experienced a number of realities as adult learners. On a positive note, their prior knowledge and experience supported them in their learning endeavours. Participants, however, experienced a number of challenges on personal, interpersonal and socialisation, and educational levels. It is important that opportunities are created to support and assist RPL candidates to complete their nursing training. This support structure, among others, should include the provision of RPL-related information, giving appropriate advice, coaching and mentoring, effective administration services, integrated curriculum design, and a variety of formative and summative assessment practices. The apartheid system in South Africa had a negative impact on the education and training systems in the country (South African Nursing Council [SANC] 2009:1). Drastic interventions were required to redress this situation. Given the racially exclusive legacy of apartheid, many individuals did not have the undergraduate qualifications required to enter higher education studies. These individuals were able to gain access only through the process of recognition of prior learning (RPL). The South African Qualifications Authority (SAQA) was responsible for the development of the National Qualification Framework (NQF), which was put in place in 1996 with the aim of transforming the educational system in the country (SAQA 2004). Recognition of prior learning is a process of evaluating knowledge and skills acquired through life experience allowing recognition in formal systems (Miguel, Ornelas & Maroco 2015:179). The NQF objectives relevant to RPL include the provision of access to education and training, and facilitation of redress of former unfair discrimination thereof. Recognition of prior learning emphasises and supports the principle of lifelong learning by encouraging individuals to continuously improve their skills. This article outlines RPL nursing candidates' experience related to a 4-year comprehensive nursing diploma programme. In the context of this study, an RPL candidate refers to enrolled nurse and enrolled auxiliary nurse students who have formally challenged the RPL process and have obtained credits for access to a 4-year comprehensive nursing diploma programme in one of the Gauteng nursing education institutions (NEIs). Recognition of prior learning has been a contested discourse and practice for more than a decade with numerous opportunities and challenges. Discourses that are more current include authors such as Letseka and Pitsoe (2014) and Cooper, Ralph and Harris (2017) who argue that academic knowledge is often organised around the dominant and prescriptive view of knowledge. This could lead to a mismatch between the RPL candidates' experiential knowledge and academic knowledge, or, on the other hand, the candidates' practice skills and expected professional skills. These tensions and contestations are both conceptual and ideological. Earlier studies established that candidates often found it difficult to 'de-constitute and reconstitute previous unconscious performance into a codified propositional form' (Trowler 1996:97). The pedagogic nature of RPL has also been questioned. Cooper et al. (2017:198) viewed experiential knowledge gained in the workplace or through community engagement as different in character, structure and purpose to formal academic knowledge. In addition, Ralphs (2012) review of the literature showed that the model of RPL practice that had been used over time viewed RPL primarily as an assessment practice. Although assessment is obviously an essential feature of all forms of RPL practice, Cooper et al. (2017:205) asserted that RPL may better be seen as a specialised form of pedagogy which provides tools to navigate knowledge boundaries in and across different learning contexts, within a system characterised by differentiation rather than sameness. Several authors have written on the potential of RPL being either positively or negatively transformative for candidates. According to Miguel et al. (2015:180), advantages primarily occurred at the personal level of the student in terms of learning, increase in confidence, the realisation of the prior knowledge and skills, the value of the life experience and an enthusiasm for further learning. Furthering the discourse on personal dynamics, Houlbrook (2012:559), however, describes student experiences of RPL in the context of work-based learning as generally being anxious and fearful and that candidates often perceive the world of academic study as alien. Nursing has historically been known as one of the professions that provides access to training and education to marginalised groups who have minimal access to formal education (SANC 2013:11). Previously, the requirements for the nursing training programme in South Africa were minimal, and individuals with poorer grades were accepted into the profession. In South Africa, the introduction of RPL was met with much criticism and was challenged by many academics who felt it was an unfair practice. They were concerned that it would compromise the quality of education and training. Academics saw the prospect of admitting large numbers of under-qualified adult students with work-related experience as a threat to the institution's reputation or an erosion of academic standards (Motaung 2009:78). According to the Gauteng NEI student affairs' statistics, the number of RPL candidates failing or terminating studies during the 4-year comprehensive nursing diploma programme was between 12% and 16% higher than non-RPL candidates (Mothokoa 2015:3). It was unclear what RPL nursing candidates' experiences related to a 4-year comprehensive nursing diploma programme at a NEI in Gauteng were. This study aimed to better understand this phenomenon. The objective of this research was to explore and describe the RPL nursing candidates' experience related to a 4-year comprehensive nursing diploma programme. The study was viewed from the vantage point of the educational theorist Malcolm Knowles' principles of andragogy. The seminal text is used as reference. In applying this theoretical perspective to the study, RPL candidates are viewed as adults who bring accumulated life experiences with them to their learning encounters (Knowles 1980:44). Adults enter education events with a large quantity of experience that varies from individual to individual. The heterogeneous life experiences of adults hold several implications for teaching (Knowles 1980:50). Adults like to be given an opportunity to use their existing foundation of knowledge gained from life experience and apply it to their new learning experience (Malone 2014:11). Adult learners prefer to voice their own opinions and have a role in directing their learning. It is also important to note that adult learning is unique and that each individual learns at their own pace and in their own way. The research setting was a provincial government NEI in Gauteng, South Africa. This study utilised a qualitative design with an exploratory, descriptive and contextual approach (Creswell 2014:190) in which the aim was to gain an in-depth understanding of RPL nursing candidates' experience. Recognition of prior learning candidates who applied for and were awarded credits for one or more 4-year nursing programme subjects between 2011 and 2013 and who were at their first, second, third or fourth level of training. These RPL candidates were either enrolled nurses or enrolled auxiliary nurses who did not meet the admission requirements for access to the 4-year comprehensive nursing diploma programme and followed the RPL access programme. The exclusion criteria were all other candidates training for the 4-year comprehensive nursing diploma programme who met the standard admission requirements for access into their diploma studies. Data were collected through face-to-face interviews. The first author conducted the first three interviews with the second author present; thereafter, the second author continued with the interviews. Thirteen nursing RPL candidates took part in the study. Data saturation (Richards 2015:154) was reached after 10 interviews. An additional three interviews were conducted to ensure that no new themes emerged. All personal past knowledge and theoretical knowledge were bracketed so that full attention could be given to the phenomenon that appeared as consciousness (Giorgio 2008:3). This was achieved by attempting to withhold all prior knowledge and past experiences, which would contaminate the studied phenomenon, by keeping a reflective log (Richards 2015:54). All data, including interview transcripts and the reflective logs, were analysed independently by the authors using the descriptive analysis technique by Tesch (in Creswell 2014:198). A consensus discussion was held to verify the final themes. Strategies employed to ensure the quality of data included the following measures of trustworthiness as described in Egon Guba's seminal text (Guba 1981): credibility (prolonged engagement, triangulation and reflectivity); applicability (rich descriptions); dependability (code recode procedure and audit trails); confirmability (triangulation and reflectivity); and authenticity (fairness, awareness, understanding, action and empowerment) (Onwuegbuzie, Leech & Collins 2008:8). Participants could choose whether to participate in this study and could also withdraw from the study without penalty. Informed consent was obtained, and participants indicated the place and time most suitable for the interview to be conducted. The identity of all participants was safeguarded. Findings are described in such a way that participants cannot be identified because of the use of identity codes. Each participant was treated fairly. Ethical clearance for this study was granted by the University of South Africa (HSHDC/251/2013) and the education institution. The study comprised 13 nursing RPL candidates. This included 2 males and 11 females. During the interviews, two participants were in their third level of study, and five participants were in their 4th year and had recently obtained their final year results. Four participants were excluded from the course because of poor academic performance (terminated). One participant received credits for all his first-year subjects and completed the course within three years. All participants were Africans and their age breakdown was as follows: one participant was between the ages of 20 and 29 years, two were between the ages of 30 and 39 years, eight were between the ages of 40 and 49 years and two were between the ages of 50 and 59 years. Recognition of prior learning candidates experienced a number of realities as adult learners. On a positive note, their prior knowledge and experience supported them in their learning endeavours. Participants, however, experienced a number of challenges on a personal, interpersonal and educational level. What follows is a discussion of the theme and categories as they emerged from the data analysis of interviews conducted with nursing RPL candidates. Table 1 provides a summary of these findings. The first theme relates to the realities faced by RPL candidates as adult learners. These include positive aspects as well as a number of challenges. 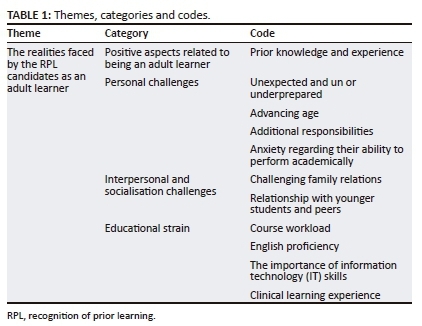 Snyman (2013:28) defines mature adults or adult learners as those learners who have left education and gained life and work experience prior to entering education again. Knowles (1980:50) argues that because adults have a richer foundation of experience, they are able to relate new learning encounters to their experience base, which in turn may become the foundation of and a rich resource for learning. Issues relating to underprepared students or students being unaware of the requirements of programmes are not unique to nursing or the South African context. This sentiment is echoed in research findings worldwide (Glessner 2015:33; Wilson & Lowry 2016:268). In a study conducted by Cantwell and Scevak (2004:143), RPL candidates perceived the theoretical structure of their courses to be much simpler, because of their acquired work experience. The authors, however, raised a concern regarding the students' perception and underestimation of the course content and the relationship between this belief and less functional learning dispositions and poorer academic outcomes. In this study, participants similarly did not fully understand that an adjustment to higher levels of conceptualisation and critical thinking was required compared to their previous level of study or experiences. This meant that they had to put additional effort into acquiring a specified learning standard. 'So, you've got to struggle, some of us must read ten times before you understand because the brain is also ageing.' (IP 141105-0011). Phipps, Prieto and Ndinguri (2013:13) acknowledged that ability, age and self-efficacy are all factors that contribute to an individual's perception of how easy or difficult learning would be for them, thus affecting their learning intentions. Brod, Werkle-Bergner and Shing (2013:10) warn that the availability of knowledge on the one hand and control processes allowing access to this knowledge on the other follow extremely different lifetime courses. One might therefore 'know' the subject content, but may have difficulty in accessing the information or may need more time or prompts to access the information. Nursing education and care is generally perceived by most nursing students as demanding and anxiety provoking (Hollenbach 2016:43). The stressful nature of nursing and nurse training often leads to physical problems and emotional stress or depressive symptoms among nursing students (Chen et al. 2015:590). Chen et al. (2015) reported a strong correlation between anxiety and depressive symptoms in nursing students. Naseer (2016) confirmed that female students suffered higher levels of mental stress, environmental stress, social stress and spiritual stress-related symptoms than their male counterparts. This could partially be ascribed to gender stereotyping where woman are expected to carry the burden of household and other social responsibilities. Not all candidates experience adaptation and socialisation in the same way. Ojo (2009) found that some (female) students preferred the informal support that resulted from casual relationships with fellow students. The author warns that this preference could potentially compromise their ability to flourish in the new environment. A negative consequence in this study refers to these candidates being perceived as forming a 'clique'. Cliques can provide a sense of social cohesion, but members also face the danger of viewing themselves as superior to anyone outside the group, thus reinforcing the marginalisation of others. Curriculum overload and constant demands for change in the education arena can have substantial negative consequences for both students and educators (Campbell 2014). We are in danger of increasing the demands on the curriculum to such a degree that we either fail to teach the basics and essentials, or place additional demands to catch up the overflow in our personal or private time. Dubovieciene and Gublinskiene (2014:143) caution that adult students should not be overloaded, and nurse educators should strike a balance between pre-existing and new knowledge. Overburdening adult students might result in superficial or rote learning. Many RPL candidates were schooled in a rote-learning educational environment. The challenge with rote learning is that memorisation becomes an end in itself, instead of a means to an end. The learning thus fails to become a building block of critical thinking. Outcomes based education (OBE) is based on the constructivist theory of learning, which argues that individuals build new knowledge by adapting their past experience and knowledge to solve new problems. Within OBE, new knowledge emerges through an active, social process, informed by the use of relevant real-world examples (Halbleib & Jepson 2014:109). Although black students were able to gain access to higher education at historically white institutions of higher learning in 1994, many institutions use English for teaching and learning - a second language to the majority of these students. Many adult nursing students are products of Bantu Education, a tool used by the apartheid government to ensure that they leave secondary school with poor English skills. This has created a significant impediment in students' capacity to handle the demands of higher education in English (Sebolai 2013:215). Language, thinking and, therefore, learning are intimately tied together. Elder and Paul (2004:157) claim that the typical university student cannot deeply comprehend what he or she reads. This problem is more apparent when students receive teaching in their second language. A limited proficiency in a language hampers active communication, which may result in a passive manner of information giving and rote learning, because it is linguistically easier to manage. The use of computerised information systems for nursing care plans, patient result management, discharge planning, duty rosters and a range of other activities has become a central focus in nursing practice as well as nursing education (Boore & Deeny 2012:176). With the rapid expansion of electronic learning environments, the need to bridge the gap between the generations of learners is critical (Maxon 2015:11). 'I have never had any problem with the practical facilities; they were all nice and willing to can teach me because … even the hospitals, I didn't even have a problem.' (IP 141105-0015). Challenges as well as opportunities for growth during clinical placements and clinical experiences are often recorded in studies exploring nurse's attrition and clinical experiences. Positive experiences include the opportunity to grow both personally and professionally (Moagi, Janse van Rensburg & Maritz 2013:361). The importance of clinical facilitators' attitudes and competence is, however, paramount and can either 'make or break' the students' experience (Roos 2014:361). This study confirms that RPL nursing candidates as adult students are faced with multiple role demands, such as having to balance their educational, work, family, partners' and children's needs. In order for them to succeed with their studies, they often make great sacrifices. They also face other challenges in terms of academic and institutional barriers, which make it more difficult for them to cope with these demands. It is therefore of enormous importance that opportunities are created in supporting and assisting these candidates to complete their nursing training. This support structure, among others, should include the provision of RPL-related information, giving appropriate advice, coaching and mentoring, effective administration services, integrated curriculum design, and a variety of formative and summative assessment practices. This study was limited in that it mainly focused on only one government nursing student affairs' statistics education institution in Gauteng, which is a single setting. This may decrease the generalisability of the findings. Recognition of prior learning candidates in other nursing programmes can also be included in future studies to compare findings from different nursing programmes. N.B.M. and J.M. were responsible for the project design, analyses of data and writing of the manuscript. N.B.M. collected the majority of the data. J.M. made conceptual contributions.